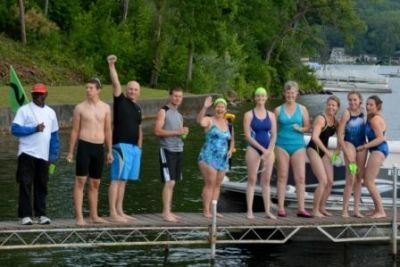 Krossin' Keuka is a .67 mile fun swim across Keuka Lake, off the shore of Keuka College. This is a fundraising event to support the Keuka Comfort Care Home. This is a fun swim - not a race. Krossin' Keuka is a fundraising event for Keuka Comfort Care Home. Swimmers must raise a minimum of $150 in sponsorships before event. To be eligible for prizes all fundraising must be submitted by July 1st. Donations collected after July 1st can be turned in at registration on Friday afternoon. Krossin' Keuka rewards fundraising prizes and incentives available for swimmers and paddlers. In order to be eligible for fundraising prizes, your sponsorship money must be in by July 1st. Swimmers must pay $25 Registration Fee, $150 minimum fundraising. Must be middle school age or older. Participants under 18 years old must have parent/guardian complete registration. In addition to the requirements for all swimmers, participants in grades 6 - 8 must swim with a designated adult, who must also be a registered participant. High school aged (grades 9-12) participants are not required to swim with a designated adult, but it is recommended. We invite participants to form their own pods!